Healthy Gal's Healthful Life: Should I Exercise at High Intensity? 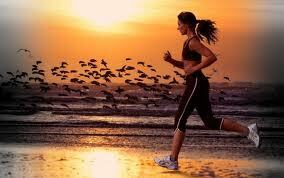 High intensity exercise has been touted as "the best way to burn fat", lose weight, and boost your metabolism. But is this really true? 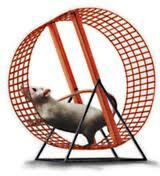 Running like a mouse on a wheel every day of the week is more likely to exhaust you than to keep you motivated and help you to lose weight. A recent article published in the LA Times discussed the controversial issue of whether high intensity exercise really does provide significant benefits. This article reviews a lot of the different science principles behind the idea that high intensity exercise will help you loose weight. In this article, the principle of High Intensity Interval Training (HIIT) is the main focus. It's a little complicated, so let me make it easier! It's an exercise strategy that was made popular by Bill Phillips in his book "Body for Life," published in 1994. Phillips claimed, "Not only does high-intensity training burn fat more effectively than low-intensity exercise, it also speeds up your metabolism and keeps it revved up for some time after your workout." With these wise words, Phillips was able to create a 17-year long belief that focused on high intensity training was the only way to go. HIIT focuses on high intensity, short duration exercises that intend to boost metabolism and burn fat. The typical duration of HIIT exercises is 9-20 minutes, and focuses on a 2:1 ratio of work to recovery. That means you get 1 minute of rest for every 2 minutes of high-intensity exercise you do. Tabata (an example of a high-intensity based exercise regimen- I've tried it, it's fun!) is based on it. Tabata focuses on 20 seconds of high intensity exercise followed by 10 seconds of rest. Why was HIIT created?What's it based on? HIIT and other similar exercise programs were created because of the concept of Excess Post-Exercise Oxygen Consumption (EPOC), which is supposed to cause heightened caloric burning after you exercise. This because after doing more intense exercise you take in more oxygen and therefore burn more calories. The basis for this was that a few studies found that EPOC was higher after high intensity exercises than it was after lower intensity exercising- and voila! The birth of high intensity exercise programs. The article in the LA times discusses research on both HIIT and EPOC as its' foundation for providing information about why high intensity exercise may not be the answer. Bill Phillip's book had provided studies that "proved" that this type of exercise was effective, but it has actually been found that the studies he referenced in his book are faulty (for a various number of complicated reasons)! To avoid making it complicated, the results of these studies are completely unreliable. So now the question, does this method really work? Phillips had based his method on the basis that you might burn more calories after doing one of his HIIT-based exercise programs. While it has actually been found that though you do indeed burn calories after you're done doing high-intensity exercise, it's an almost negligible amount (1000 calories burned in a workout and only 150 calories burned in the post-exercise period). Because of this finding, it may not be worth it to kill yourself in your workouts for an extra 150 calories. Burning or cutting an 150 calories isn't that hard after all. -Put one less Tbsp of mayonnaise on your sandwich (50 calories), 1 less Tbsp of Jam on your toast (60 calories), and 2 less packets of sugar in your coffee during the day (30 calories)- see how easy that is? Or-Want to work out to burn 1,000 calories without doing high-intensity exercise? -Do moderate intensity exercise for the same distance traveled in the high-intensity exercise - run quickly for 2 miles, or jog for two miles- you're going to burn almost the same amount. The calories burned during the exercise will be almost the same, and you will still have some calorie burn post-exercise. Do something that will keep you interested and that you can sustain. That's not to say don't do high intensity exercise. If you can, it's a really good idea to mix it up- some days do high intensity and some days do more moderate-paced exercise. But remember that we are all different, so what works for one person may not work for you. If you want to do high-intensity every day because it works best for you- power to you! But for most people, the goal of high-intensity every day is not practical- nor is it enjoyable. Don't be discouraged, do what you can and as often as you can. Always remember that some is better than none. And if you've had a hard few days of working out, take a break. Rest is an essential part of fitness and of health!